We’d like to share an update on the Sikorsky-Boeing SB1 Defiant helicopter as provided today at the Army Aviation Association of America annual summit. Defiant achieved its first flight on March 21, 2019. The aircraft flew for a second time on April 5. During these two initial flights Sikorsky pilot Bill Fell and Boeing pilot Frank Conway hit every test point and completed each data point we had planned to complete. The team proved out the expected speed for these tests: 10 kts forward, left, right and rearward. It also proved out hover performance maneuverability, pedal turns, and a hover ladder from ground level up to 30 feet altitude. These tests are a first step in getting to the flight envelope we hope to achieve with this groundbreaking aircraft. Over the summer of 2019 we expect to expand the envelope in flight tests with additional speed and maneuverability and provide the U.S. Army with the necessary, robust, and relevant data in a timely manner that will enable them to make fully informed decisions as they pursue the Future Vertical Lift program. 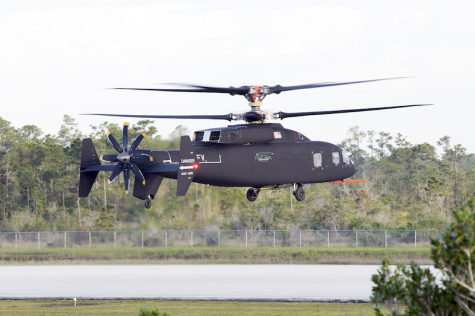 Sikorsky-Boeing SB1 Defiant test pilots achieved first flight March 21, 2019, and flew the aircraft again on April 5. The Sikorsky-Boeing SB1 Defiant helicopter has conducted two successful test flights to date. These flight mark key milestones for the Sikorsky-Boeing team, and is the culmination of significant design, simulation and test activity to further demonstrate the capability of the X2 Technology.